All new grass, be it from sown seed bed or freshly laid sod, is a delicate thing. Allowing the roots to develop into the surrounding soil without disruption of any kind is at the top of the list of requirements for developing a healthy lawn right after adequate water. 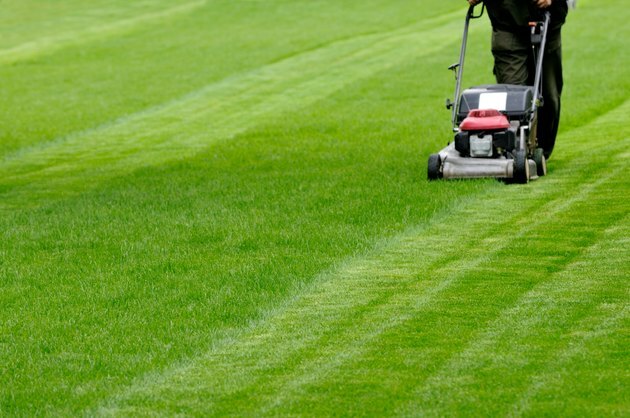 Holding off on mowing as long as you can and then tapering the blade reduction over time reduces the stress on the grass roots and will ensure a healthier establishment process. 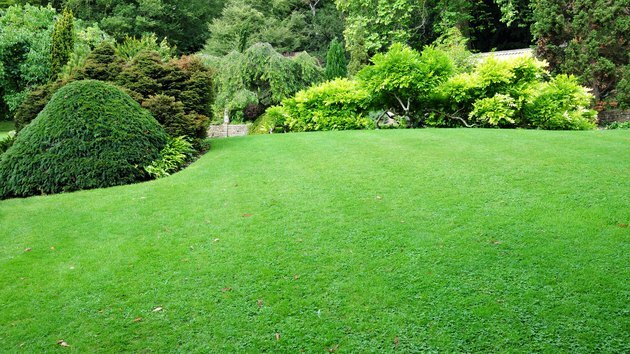 When do you mow your new lawn? Wait to mow until your new grass blades are at least 3 and 1/2 inches tall. Though it will seem like a long time, wait until your new grass blades are uniformly at least 3 and a 1/2-inches tall. Long blades require less water, will discourage weed formation during the establishment phase and therefore allow all of the grass' energy to be focused on developing deep, strong and drought-resistant roots. The root development in the establishment phase is the largest determinant in the long-term health of the lawn. Also, importantly, not mowing during this phase keeps your feet and mower off of the lawn - the weight of which can make micro tears in the growing roots, delaying their establishment. Don't take all the length off at once. When mowing for the first time do not take off all of the blade length in one mowing session. Take no more than a third of the length off in the first mowing pass. This reduces the threat of shock and stress placed on the new roots. Wait at least 3 to 5 days before making a second mowing pass again, removing no more than another third of the remaining length. Lower your mower blade in each successive mowing until you reach the desired blade height. 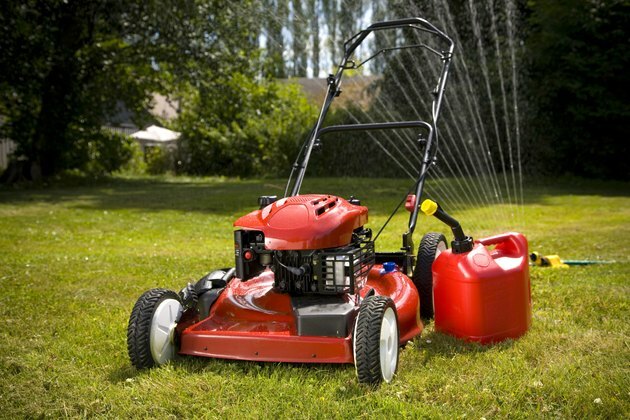 Cut grass with clean and sharp mower blades. You always want to cut grass with clean, sharp mower blades but this is particularly important when mowing new grass or lawn. New grass is more tender, flexible and finer than more established grass. Dull cutting blades cannot make a clean cut on new grass and have a tendency to bend and tear, or pull on the grass blades which can damage the roots and invite disease into the blades at the tear points. Clean blades are important because blades with buildup from previous use may harbor disease or decaying material that can get introduced into the fresh cuts on the young lawn and spread bacteria and fungus into the new grass. Use either household isopropyl alcohol or a bleach solution made of 1 part bleach to 10 parts water on a clean rag or cotton padding to wipe down the mower blades. Use a scrub brush to loosen any built up dried material or rust on the blades. 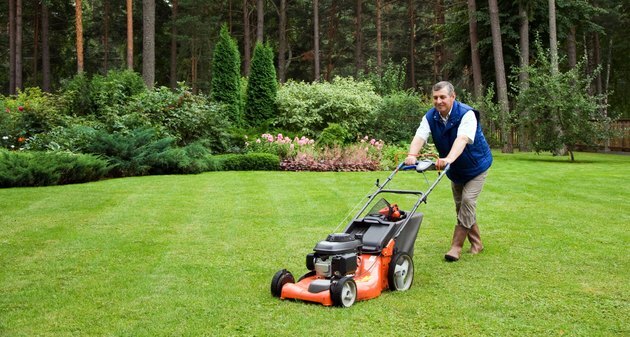 Alternatively, have your mower serviced by a professional who can both clean and sharpen the cutting blades before embarking on mowing your new grass.